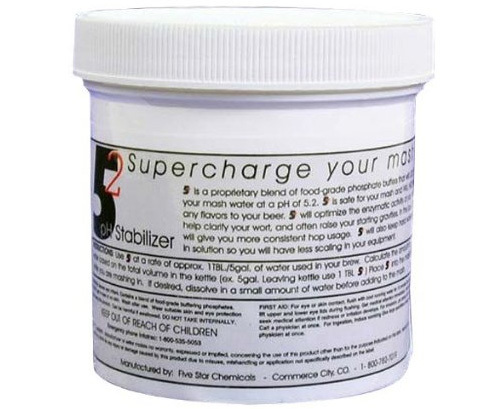 5.2 pH Stabilizer (shown in picture) is a product sold by Five Star Chemicals that according to their website "is a proprietary blend of buffers that will lock in your mash and kettle water at a pH of 5.2 regardless of the starting pH of your water". 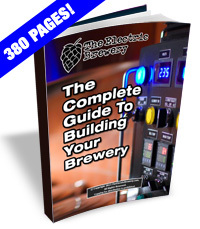 The manufacturer states that one tablespoon per 5 gallons of finished beer is all that is required. We tried this product with a simple blonde ale using our very soft city water which has a high pH of over 8 (relative to room temperature) when untreated right out of the tap. This beer was made mostly with lighter coloured 2-row grain. There were no darker grains that would help lower the pH into the proper 5.2 pH range so we knew that some extra help would be required even after we added our usual brewing salts to alter the flavour profile the way we wanted. Many of the brewing salts we use lower pH, but often not enough. Even though our water's pH is very high it's very soft (has a low buffering capacity or residual alkalinity) so it doesn't take much to lower the pH. Normally if our mash pH is still higher than 5.2 (relative to mash temperature) after we add our brewing salts and re-measure, we add a bit of 88% lactic acid to bring the pH down further. It usually only takes one milliliter (mL) or two at most. This seemed like a good test to try the 5.2 pH Stabilizer instead. We mixed in our grain with the strike water (called 'doughing in'), along with some salts, and let it sit for a few minutes. Our mash pH measured 5.59 (relative to mash temperature). The grains and salts had dropped the pH of the water from over 8 all the way down to 5.59. Not bad, but still too high, as it should be around 5.2 to 5.3. So we added 2 tablespoons of 5.2 pH Stabilizer (the instructions say to use 1 tablespoon per 5 gallons of final product and we're making 10 gallons), stirred well for a few minutes and then measured again to find that it was now 5.55, or a drop of only 0.04. Hmmm, not very much of a drop at all. What happened to that claim of "locking in our mash pH at 5.2 regardless of the starting pH of our water"?